Confirmation Mail along with exact address will be sent to you. Feel free to refer about this session URL to your friends. Registration is Must for the session. This can be a unique experience for participants as this workshop integrates philosophy, psychology, medical science and spirituality very well. 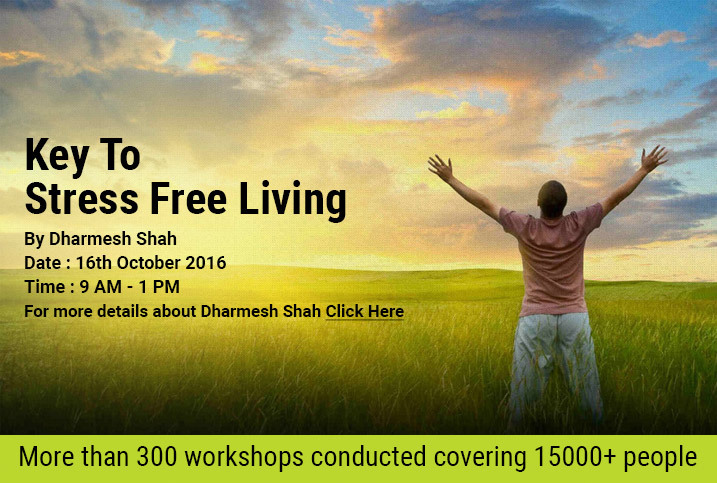 This is precisely the reason why the people who have attended the workshop have labelled it a 'psycho-spiritual thriller'. Few facts about stress and its adverse effects on humans. Basics of Brain and its EEG patterns. Basic and simple solutions based on psychology. Understanding Energy field and Higgs Boson impact. Energy Field based solutions for stress release. Simple and Focused objective - Relieving stress from daily life. Fast paced and completely interactive. Techniques that can be implemented in daily life by professionals. Just 4 hours of your time needed to trigger the transformation. May turn out to be first major step towards making your life a celebration.